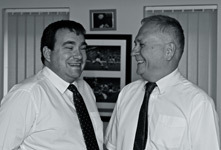 We are a unique, innovative firm of accountants who aim to deliver the highest possible standard of expertise through our team of Qualified Chartered Accountants, Chartered Certified Accountants, Chartered Tax Advisers, experienced senior staff, trainee accountants and business consultants. Established in Carmarthen over 30 years ago our portfolio of clients has increased significantly with clients based locally, across the UK and overseas. We re-branded following a de-merger in 2004 clearly identifying that our client’s needs were best serviced by a personal and professional team. Our team of 24 professional staff (including three administrative staff members) have a combined experience of more than 210 years and include Welsh speakers at all levels. We encourage staff at every opportunity to develop to their full potential. This has been recognised through our achievement of the Investors in People Award. In addition to traditional auditing, accounting and tax compliance services we also provide advice on how to improve and develop your business. Whether you need an integrated business strategy, access to corporate finance banking broking advice or specialist tax advice we are here to help you achieve your goals. We provide pro-active rather than reactive advice and one of our unique selling points is our flexibility. Our number one priority is to provide excellent client service from a knowledgeable yet approachable team. We are not just number crunchers - we listen to your needs and provide you with solutions. Our team are fully conversant with most accounting software packages (desktop and cloud solutions) and have specialists who can assist all clients in providing support and with training needs. We can offer an online accounting solution including remote access to your computer systems to assist you quickly and efficiently. We also have Client Zone for clients to upload their electronic files. We are innovative in our approach and use the latest technology to the benefit of our clients. We use our modern approach and tailored service to maximise your profits while minimising your tax bills and planning for the future. Why not call us today and let our young, dynamic, experienced team assist you develop your business.